We are constantly challenged by environmental concerns in local areas, but they are usually ignored, and then there is conflict. One such matter is our campaign for the Shoreditch Forest Garden. Consultations were terminated as the developers wished to have The Mayor of London sign off the project expeditiously to avoid meeting the requirements of the local environment. We are now trying to get the developers to uphold their original promise to install a public park the full length of the railway viaduct in accord with the outcome of the original consultation. Profit before the environment is not the way forward. Let us have your comments which will be published on our website. 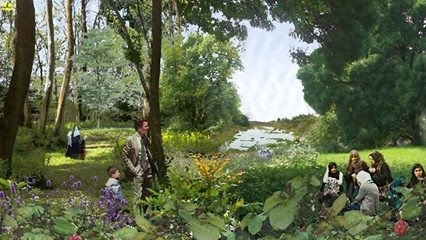 To have the largest forest garden in Europe in Central London involves a fight, but it’s a fight worth having because if it’s won it will set a precedent. Hammersons, the developer, partnered with Ballymore never cease to come up with surprises. Originally, these arches were to be entirety in the public realm with a community park. However, having abruptly terminated any further discussion with Hackney and Tower Hamlets, and with the local community, the developer has decided to go to a higher authority and revise their plans. So, where are we now? The revised plans state that the previous untouchable public realm must have some hotels on it because there would be other areas with trees and grass within the defined area. The result of this would be that we get one third of the viaduct as public realm. In its original form, the area would have been the largest forest garden in Europe, but now that is under threat. Little attention is paid by these unscrupulous developers who refuse to recognise what a natural park could do to improve the overall climate, as well as the poor air quality of Shoreditch. The latest proposal is a scheme that will worsen the already intoxicating air in the area. Perhaps they will next decide that the entire grade II listed viaduct should be built on to satisfy their greedy pockets! If you feel strongly about this issue, please sign the Petition. Blaise was determined to transform the city and its fortunes. In the late 1980s, along with Nantes’ socialist mayor Jean‐Marc Ayrault, he set about creating culture wherever he could. They had two cardinal rules: events had to be free, and they should take place outdoors or in public spaces. Other cities sat up and took notice, as did the national press. The Allumées festival was only ever intended to last for six years. “We wanted there to be the anticipation and thrill of the pre‐programmed ending” Blaise says, but in that time, it kickstarted a new phenomenon: using abandoned industrial spaces for theatre, art and music. In 2000, Blaise became the founding director of a major new cultural centre, Le Lieu unique, in the former LU biscuit factory (makers of the famous Petit Beurre) on the river Loire. In 2007, he oversaw the creation of a contemporary art biennale, Estuaire. That too lasted six years and has resulted in a permanent arts trail by French and international artists. The city’s most recent arts event is a two‐month summer street festival, Le Voyage à Nantes (the Journey to Nantes), launched in 2011. “The idea of the festival is to colonise every part of town with artistic creation” Blaise says. The subsequent shift in attitudes has been dramatic. Now, even the shopkeepers and traders who were at one time the harshest critics, want artists to create quirky and humorous signs or installations for their shop‐fronts. Furthermore, designers, artists and architects are now being commissioned to do much more than just public art installations. Perhaps most importantly, Blaise has proved that culture can make money. Voyage à Nantes spends €3m (£2.5m) on the festival, but the economic returns are now put at more than €48.8m, thanks to last summer’s €15,000 visitors (of which 15% were from neighbouring European countries). With between 6,000 and 9,000 people moving here every year, Nantes is now one of the fastest growing cities in France and unemployment levels are also consistently lower than the national average. One of Blaise’s many mantras is: “When money is well spent, culture is never too expensive.” But he understands that none of this would have been possible without political continuity. Ayrault was mayor of Nantes for 23 years. His successor, Johanna Rolland, is also a socialist and keen to carry on this cultural project. The East London Garden Society put forward the idea that the best grower in London be found, allowing all who wish to take part to expose what London produces and grows. It is our belief that gardening should be well funded for those who see it as a passion, or for those just starting out. Sometimes propagated as an ornamental shrub, the elderberry bush is a member of the honeysuckle family. It is actually a small tree, with an abundance of delicate white flowers emerging as berry clusters generally between August and October, mostly in cool‐to‐warm areas of the country. The American Indian traditionally used every part of the elderberry plant including making tools crafted from the branches, such as arrow shafts and pipes. This tiny black fruit yields an abundance of juice for its small size. When cooking elderberries for sauce, some may prefer a little extra sweetness. Elderberries freeze in a glass jar after washing and patting dry. For sauce or syrup, dissolve honey in warm water, chill well, and then pour over the elderberries packed in freezer containers. When elderberry hunting, only the blue variety (also identifiable by the white surface coating, similar to blueberries) is good for eating, although they require cooking, because the raw berries contain a cyanide‐like chemical. Green, unripe, or bright red elderberries are bitter and possibly toxic, even when cooked. In 1899, an American sailor accidentally discovered that cheap port wine coloured with elderberries relieved his arthritis. This may have been the basis for a number of experiments on the healing properties of this fruit. Sambucus Nigra (European or black elder) may be the cultivar most often used for medicinal purposes throughout the world and over decades and centuries of application. Modern research holds that elderberries may have anti-inflammatory, antiviral, and anticancer properties. Other traditional uses of elderberry flowers are as external antiseptic washes and poultices to treat wounds, and as an eye wash for conjunctivitis and eye inflammation. It has been used for cosmetic purposes for millennia due to the reputation of distilled elderberry flower water to soften, tone, and restore the skin and lighten freckles. The flowers can also be steeped in oil to make a lotion that relaxes sore muscles and soothes burns, sunburn, and rashes. Chemicals in both the flowers and berries may help diminish swelling in mucous membranes like sinuses and help relieve nasal congestion. Herbalists still use it to soothe children’s upset stomachs and relieve gas. Elderberries are reputed to have diuretic and detoxifying properties, and therefore considered good for weight management. To begin with, elderberries are a very good source of fibre vitamin A, providing 17 percent of the daily value, but eclipsed by infection‐fighting vitamin C with 87 percent; reportedly more than any other plant besides black currants and rosehips. Other prominent ingredients in elderberries include iron (13 percent of the daily value) as well as potassium, vitamin B6, and lots of beta-carotene. Antiviral components of elderberry fruit extract were tested and found to effectively inhibit Human Influenza A (H1N1 virus) in vitro, possibly by blocking the ability of the virus to infect host cells. The extract was so effective, that researchers compared it with the prescription medications Amantadine and Oseltamivir (Tamiflu). As a moniker, the term ‘elder’ is derived from the Anglo-Saxon ‘aeld’, meaning fire, because the hollow stems of this plant were used to gently blow on flames to intensify the fire. ‘Sambucus’ is a Greek word meaning ‘wind instrument’. Native Americans once used elderberry branches to make flutes, so the tree was sometimes called ‘the tree of music’. Hip and knee pain can be extremely intense and debilitating, aggravating even the simplest movements. To soothe the pain, patients usually use painkillers that just temporarily numb it, and might lead to severe side-effects. However, natural herbs are an effective way to treat joint pain and regenerate the cartilages. This recipe is a natural antidote that will alleviate hip and knee pain, without causing any side-effects. Boil the water and add all the ingredients. Cook them for 5 minutes and remove the pot from the heat. Leave the infusion to cool for 15 minutes, strain, and store in the fridge.